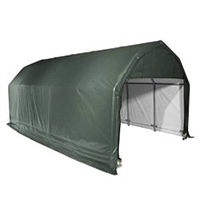 Barn Shelter with Green cover.-Bolt hardware at every connection point ensures a solid structure.-9 oz, triple-layer, chemically heat bonded, enhanced polyethylene, rip-stop fabric cover.-UV-treated inside and out with added fade blockers, anti-aging, anti-fungal agents.-White interior lining for enhanced illumination. 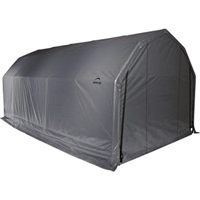 Includes a fitted cover, front and back double zippered door panels, vent kit, auger anchors. Color/Finish: -Bonded with DuPont Thermoset baked on powder-coated finish to prevent chipping, peeling, rust and corrosion to the frame. Specifications: -Hot air fused at the seams and 100pct waterproof. Assembly Instructions included. -Slip fit frame connectors and swedged tubing for easy assembly. Heavy duty 2'' diameter all steel frame.